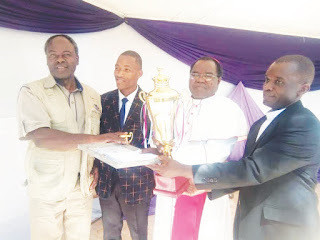 Bishop Michael Bhasera (third from left) and Fr Cleophas Magundani (right) handing over the trophy to Gokomere High head, Aquinos Mazhunga and the choir conductor Aaron Chidhanguro. 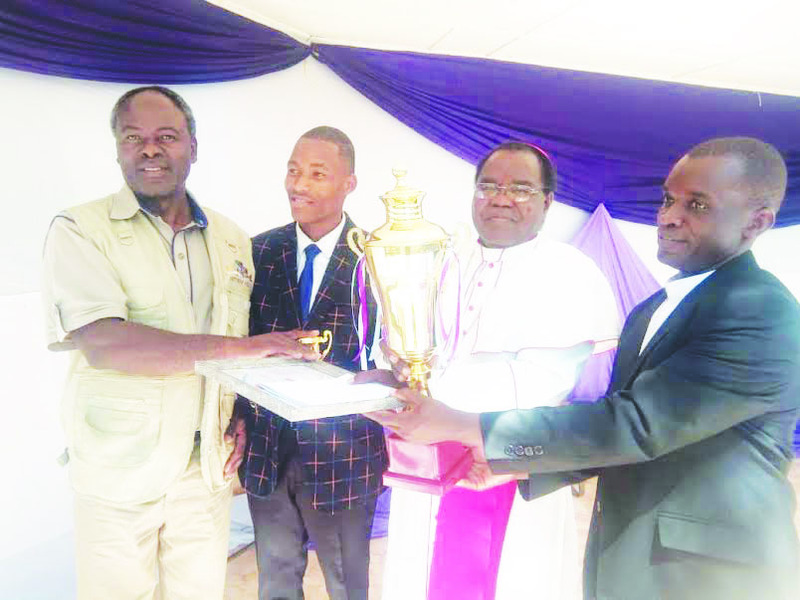 MASVINGO - Gokomere High School has won the Deanary Choir competitions after beating 11 other choirs at an event held at Don Bosco Parish on Saturday. The theme of the competition was ‘A call to holiness through singing. Bishop Michael Bhasera graced the occasion’. Gokomere High School scooped the first price for both their own song and the set piece. They won a trophy and prize money. On second position was St Theresa Rujeko Parish, St Don Bosco Parish came third, St Peter and Paul Parish came fourth, Shingirirai College singing for the first time fifth, St Don Bosco Primary School number sixth, Matova School number seven, Gokomere CPS number eight, St Barbara Mashava number nine, Gokomere Mission number 10 and Mashava Primary number 11. Don Bosco Primary School was judged the best junior choir. From the deanery level dioceson competitions will be held at Mukaro Mission in June. The national competitions will take place at Gokomere Mission to commemorate the day of their patron Saint St Cecilia. In his speech the diocese’s spokesperson and Vicar General Rev, Fr Walter Nyastanza said, “all choirs are to be united as one family and the aim of the diocese of Masvingo is to work as one people”.